Sitting on its location on the Causeway Islands, you can see the colorful, odd shaped building that is the Biomuseo from various points in the canal. The Biodiversity Museum, Panama Bridge of Life, designed by celebrity architect, Frank Gehry (his first design for Latin America) is a must see. We have to ask though, “How could you miss it”? Gehry designed it to catch more than your eye. 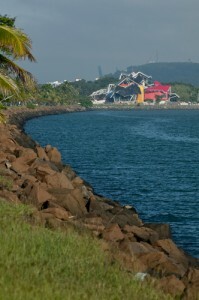 The Biomuseo sits at the end of the Causeway, facing the Pacific, at the entrance of the Panama Canal. It enjoys panoramic views of the ocean, of the Bridge of the Americas and of cargo ships entering the canal. The construction required new techniques to be engaged, due to the odd, radical shapes and angles that were designed by Gehry for the building. Many of these techniques and types of building materials used were a first for the country of Panama, as reported by the structural engineer of the project, Antonio Amado Diaz. Each panel of the side is painted a different, bright color, paying tribute to the buildings tropical location. The Biodiversity Museum opened in October of 2014 and is a popular tourist destination inside Panama. It features eight exhibitions which spotlight Panama’s rich biodiversity. The museum also features meeting rooms and rooms where small events can be hosted. Exhibitions tell us more about the origin of the Panamanian isthmus and how it changed and impacted the planet. Eight gallery spaces such as the Gallery of Biodiversity, Panamarama, Building the Bridge, Worlds Collide, The Human Path, Oceans Divided, The Living Web and Panama is the Museum are what these 8 galleries are aptly called. Each wows and respectfully pays tribute to an aspect of nature within the country. ©2017 Magnolia Inn, all rights reserved.